Odsey is a hamlet in Cambridgeshire close to the border with Hertfordshire and near the town of Baldock. 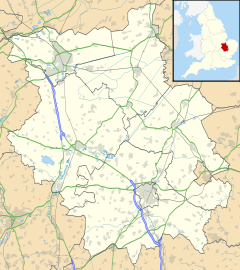 It contains a hotel and has a main-line railway station (Ashwell and Morden) which services the three closest villages: Ashwell, Steeple Morden and Guilden Morden, and offers direct train links to Cambridge and London Kings Cross. It is situated in the parish of Steeple Morden. The original "Hundred of Odsey" was named after the hamlet, and the area was important in the past as a stop on the Icknield Way. ^ "British History Online". London: British History Online. Retrieved 2013-02-12. This Cambridgeshire location article is a stub. You can help Wikipedia by expanding it. This page was last edited on 8 November 2018, at 12:20 (UTC).